Growing marijuana is a science. Every seemingly little aspect of the cultivation process matters when it comes to the final product. From the amount of light cannabis receives to how much you water the plant, all the way down to the pot you grow it in. Yes, the pot you use to plant your pot matters. Even the pot’s size matters (sorry, fellas). So, what is the best size pot to grow cannabis? Let’s get to the bottom of it. If you want a happy pot plant, you need to make sure its roots are happy too. After all, your cannabis plant grows from that very root! You need to make sure that the pot you put your seedlings into allows enough room for the roots to grow and has plenty of areas underneath the soil that allows for drainage. Moisture - When roots dry out, they die. Oxygen - Any living thing needs to breathe this bad boy in. Nutrients - The roots are the first line of defense when it comes to intaking nutrients. If the roots get fed, the plant gets fed. Adequate pH Levels - pH levels change the genetic makeup of plants. So, ensuring the roots have the correct pH level can help reverse any damage that lousy pH levels may have done. So when purchasing a pot with roots in mind, you want to make sure there’s a lot of holes at the bottom so that the plant doesn’t become overwatered. Under the pot, you want to place a tray or saucer to catch excess water (unless you want to flood your house). The soil will also slowly absorb this extra water keeping them happy. When you are beginning your cannabis cultivation, you want to start small. If you place a bunch of tiny seedlings into a large container, it dramatically increases the odds that you will overwater them. When this happens, you deprive the plant of oxygen, effectively choking the life out of it. Also, planting seedlings into a larger container can slow down the process. Therefore, a lot of people starting their growing journey like to put their seedlings into a SOLO cup. See, there’s more to those things than just being beer pong party cups! If you do use a SOLO cup for this process, be sure to poke enough holes at the bottom to provide adequate drainage for the plant. When you start the planting process, you will have to water your seedlings almost every day. Seeing as there is so little soil in the space, the roots pretty much soak up everything you pour into the cup. If SOLO cups aren’t your thing, you can also start off with a 1-gallon pot. Marijuana plants are sort of like koi fish. They grow in relation to the environment that they are planted in. As the leaves start to hover around the rim of the SOLO cup, it’s time to move the little fish into a bigger pond. When the seedlings reach this point, you want to transplant them into a container that’s about twice the size of the one that they came from. Repot the seeds and follow this process as your plant continues to grow. Transplanting seedlings can sometimes be too shocking for the plant to survive. Here are some tips to successfully switch from a small pot to a larger one without killing off your plant. Water the seedlings first. You want some of the soil to hold onto the roots so that they don’t dry out as you repot them. Water will make sure the soil latches onto the roots and covers them up during this process. Don’t tug the seedlings. To avoid damage, use a butter knife or trowel to pick the seedlings from the soil. Lightly remove seedlings from one another if they are stuck together. Place them in a new pot. Mix in some old soil that it used to along with new soil full of nutrients. As your plant continues to grow, the size of the pots increases as well. Therefore, how big a pot you need to buy depends on how big you want your cannabis plant to be. Rule of thumb, your pot should hold up to 2 gallons per 1 foot in height. While this is a general guideline to follow, it is not set in stone. Like all living things, each plant is unique. Depending on access to light, amount of water, and the microorganisms living about in the soil, all cannabis plants will come in different heights and widths. Therefore, you must determine if you need a new pot as the plant continues to grow. 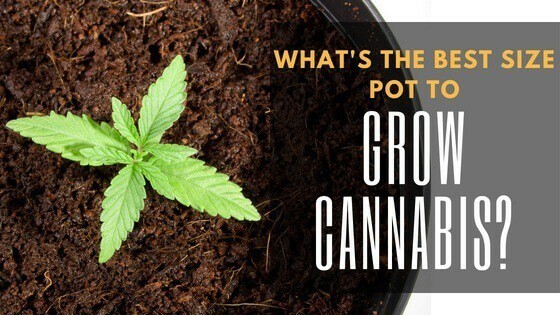 What is the best size pot to grow cannabis? Well, that depends on the stage of life your plants are in and the size you plan on growing them. Ideally, you want to transplant the plant as little as possible. So, after you sprout your seeds in a small pot, move them to the size you plan on keeping them for the rest of the grow. What size pot do you like using for cannabis?